You are ready to do what it takes to live your greatness. Are you tired of struggling to Manifest your Dreams and Big Vision? The Secret to accessing the Quantum Space is within you, so you can manifest anything you truly desire. To build your dreams, fulfill your desires, and activate your potential, so you can breakthrough obstacles & powerfully transform how you live life and conduct your business. The Quantum Transformation formula is an 8-part Online interactive Training Course with international change agent and conscious transformation teacher, Theresa Bullard, Ph.D. If you are ready to take the Quantum Leap, CLICK HERE! Do you feel like you have more hidden greatness & potential within you, but are falling short of being fully connected to it & really living it? Are you ready to learn a “Secret Technique” that will change everything? Is there something brewing deep within, with a yearning to let it out? What is this burning missing piece deep within you? How do you go about shifting it? How do you harness its power for your greater potential? Do you ever wonder if the disconnection you feel is distancing your from the things you truly desire? Wanting to make a more impactful contribution to your business, community, relationships, or our World…but you just don’t know how. See, I experienced all this myself. That sense of discomfort and like something was missing relentlessly gnawed at me for way too long. Then one day the answers came to me with crystal clarity, and these answers lay at the foundation of what I teach and why I teach it. By combining my backgrounds in physics & spirituality I have developed a rapid approach to help people like you make breakthroughs, manifest your vision, and get into creating a better, more fulfilling life…it’s called the Quantum Transformation Formula, and it’s a blueprint for living a life of greatness. Because I am a scientist, I was searching for something deeper that had true understanding. Yet it also had to be grounded and practical, AND intuitively resonate with me. What I discovered was an ancient tradition that had been developed over thousands of years. It was secretly used by some of the most influential and successful of people – people that helped shape our world today. In a very simple and practical way, this ancient tradition blended together science, consciousness, and spirituality as one. As I worked with these ancient teachings myself, and at the same time actively being immersed in the world of modern science, I came to realize the keys to uniting the discoveries o Quantum Physics, Consciousness, Spirituality, and Ancient Alchemy. By combining these key discoveries together into an integrated whole, I developed a “secret technique” that changed everything for me. This technique is truly a revolutionary formula for transformation and manifestation, and I am very excited to share it with you. Now is the time for your transformation, and you feel it. In this 8 Week Online and Interactive Training, You are guided through the 7-step Quantum Transformation Formula. You’ll discover how you can use it to powerfully re-create your life and Breakthrough any obstacle. Experience more freedom and flow in your life as you discover how to work smarter and get time to be on your side more. Expand your capacities to manifest your vision, make breakthroughs, and creatively solve problems. Create a meaningful career and life path that thrills you. Become more fulfilled as you connect with your greater self and make a greater impact. Enhance your clarity, awaken your intuition, and make better decisions from a place of higher consciousness. Be a part of the next great wave of game changers who are Quantum Transforming their lives and our world. Here we will discuss what has influenced our ways of thinking, how it limits us, and what we can do to break free into a new mindset, a Quantum Mindset. We’ll also introduce some basic concepts of Alchemy that will be used in this training for accelerating your transformation. Understand how to create your Vision using the Quantum Principles to hyper-focus like a laser and make it manifest. You cannot do what you cannot see. Illuminate by Raising your Vibration, and actually shifting into a higher state of Consciousness. “You cannot solve a problem from the same consciousness that created it. You must see the world anew. Experience Stillness. Accessing “the Gap.” This is where you discover how to dive into those Quantum Principles for Life. How to tap into the Gap, where the Quantum Space becomes accessible using the 4 Quantum Keys of harnessing vast potential. Plant your Seed and Ignite the Spark for making Creative Breakthroughs. You discover how to not only catalyze a Creative Breakthrough when you need it, you also discover how to access truly new ideas for solving any problem that may arise. You discover the quantum phenomenon that affects all of us, and it is one of the most enigmatic aspects of Quantum Physics, called the Observer Effect. At this point you know how to open the field of possibilities of your clarified vision, and you collapsed it picking what you desired. Now you create a plan of what to do, how you can do it, and the different ways to manifest it. Your practical blueprint is formulated here. Discover how to fully envision yourself, with your senses fully engaged, taking the actions, reaping the rewards, and seeing the effects of your success! Tap into how Music & specific Rhythms and Frequencies can be harnessed to support your expanded states of consciousness. Discover the power of solfeggio frequencies, brainwave entrainment, and learn what parts of the brain you are trying to access, and how you can accomplish actual alchemy in your body. We are a community committed to accelerating human evolution towards a thriving era of imagination innovation and sustainability. By combining science, consciousness, and new paradigm alchemy, we activate a higher level of consciousness and a deeper sense of purpose. We are all developing consciously for a better today and an even better tomorrow. Each Module gives you easy and practical steps to follow, guiding you through the 7-step Quantum Transformation Formula. Discover How Music & Oscillatory Rhythm and Frequency can be utilized through modern technology to support your expanded state of consciousness.Learn about what parts of the brain we are trying to access and how you can accomplish actual alchemy in your body. 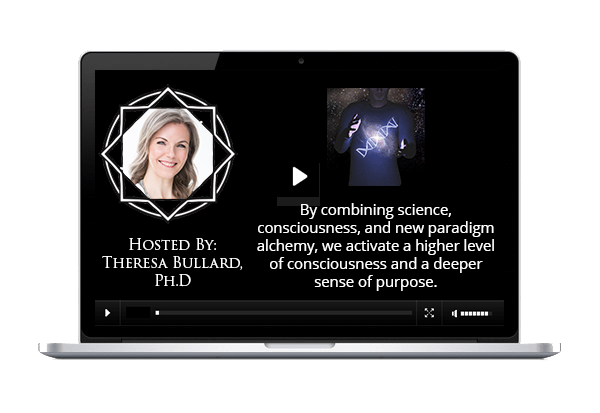 Listen to Dr. Theresa Bullard as she goes deeper into your application of the Quantum Transformation Formula through three 60 minute webinars that were recorded live. Leads you through the Quantum Transformation Formula as a guided meditation process, supported by brain wave entrainment and solfeggio frequencies. Boost your creative faculties. Enhance your process of accessing heightened states of consciousness. Manifest your greatness! Extra audio tools and worksheets that support the integration of each of the steps to the Quantum Transformation Formula. Register today for this course. Listen to Dr. Theresa Bullard. Absorb the information and training, take action and use the tools and exercises given to you on a daily basis for 30 days. If you do not notice any benefit at all, contact any member of our team, and we will ensure that your money is refunded. P-E-R-I-O-D.